1. Jimmy Eat World, Chase This Light (2007) – This entire CD is great. It is catchy and creative. They are a great talent that I love! I never get tired of this CD and listen to it all the time!!!! Feeling Lucky is my favorite song on it. 2. Jacks Mannequin, The Glass Passenger (2008) – I think they have grown to become one of my all-time favorites due to his passionate singing. He is real, talented and I can't get enough of him. :) I love all the songs but I think The Resolution is my favorite one on it. 3. Live, Throwing Copper (1994) – This CD launched my passion for alternative music. I wore this CD out and they were the very first concert I ever saw. I Alone was one of the great many songs I loved by them. 4. Mandy Moore, Wild Hope (2007) – A snooze at first listen, but quickly became one of my favorite, comfortable, familiar CDs. I love to listen to it when I am relaxing or just in a happy go lucky mood. If I had to choose a favorite, it would be Few Days Down. 5. Shakira, Laundry Service (2001) – Fueled my passion for Spanish pop and sold me as a Shakira fan for life! Te Dejo Madrid is my favorite song on it and I love to sing it:) She and Paulina Rubio are fabulous. 6. Matchbox Twenty, Yourself or Someone Like You (1996) – I thought I was so cool when I was 16 blasting this cd in my new car, oh and I had a huge crush on Rob Thomas. Saw him in concert 3 times! 8. Garbage, Garbage (1995) – This cd really started my love for feminist music. I have a great admiration for strong independent women. I'm Only Happy When It Rains became one of my all-time favorites and I am a very devoted fan still today. Shirley Manson is awesome in concert! 9. Tom Petty and the Heartbreakers, Greatest Hits (1993) – Tom Petty and the Heartbreakers gave me an appreciation for music that is not so shiny and new. Couldn't live without them! Last Dance with Mary Jane has to be my favorite song of all time. 10. Faith Hill, Take Me as I Am (1993) – This CD really sparked my love for country music back in the day. I loved Wild One because it reminded me so much of myself. 11. Dixie Chicks, Fly (1999) – It helped me through my years in college. :) Cowboy Take Me Away will always be my favorite. 12. Charlotte Sometimes, The Wait (2011) – She gave me hope. She reminded me that there is nothing you can’t do if you put your mind to it. She is a great self-recorded artist and I love all of her stuff. I think Done is my favorite song. 13. Kylie Minogue, Fever (2001) – This kept me company during my party days when I was running wild from my first taste of real freedom... lol. I loved the hit Fever. 14. Good Charlotte, Good Morning Revival (2008) – I love these guys! They are catchy and energetic. This CD kept me up and going whenever I was tired and ready to bail on my obligations. 15. Paula Abdul, Spellbound (1991) – I was obsessed with this CD! I even wrote down all the lyrics and knew them by heart! I was such a dork! 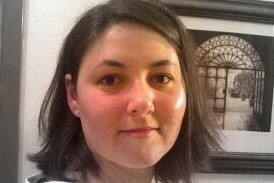 Andrea Heltsley is a biology nerd who loves reading just about anything paranormal and some chick lit. She enjoys sunshine and her two Italian greyhounds with her husband. She always writes to music, it helps the creative process. Dissolve is her first novel. She been writing ever since she was in grade school and have finally decided to make a career out of it. More books to come summer 2012 and 2013. 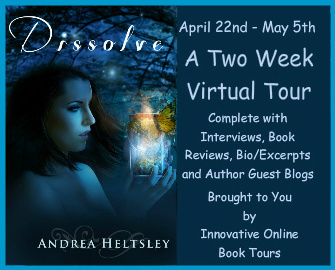 Follow Andrea and stay up to date on Dissolve and her other projects! Everything seemed to be going right for Cora. She had a wonderful fiance, a great best friend and a fulfilling life. 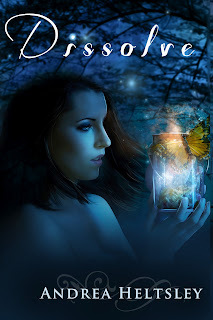 One day, a tragic event causes that life to crumble around her. She turns to her best friend in her time of need. 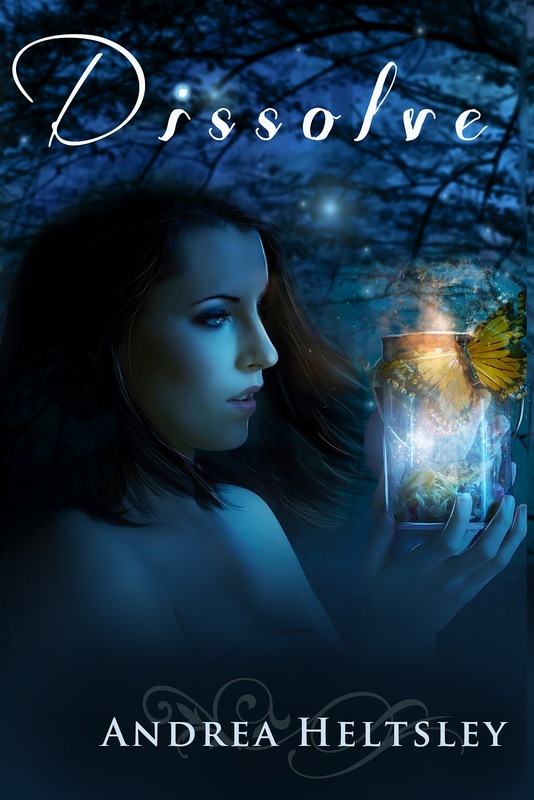 They embark on a search for answers, delving deeper into a web of magic and destruction. The closer they get to the truth, the more questions they have. To Cora, magic was the stuff of fairy tales. Immersed into a very different kind of world, the real storm was just beginning to take hold.